The Western Region is a peripheral Irish region which is made up of the counties Mayo, Galway and Roscommon. The map above shows the region on a full map of Ireland. You may be asked to draw that in an exam although it is unlikely. It is far more likely to be asked to draw a detailed map of the Western Region which is just of the three counties. I have uploaded a map I have draw of the region which can be seen below. 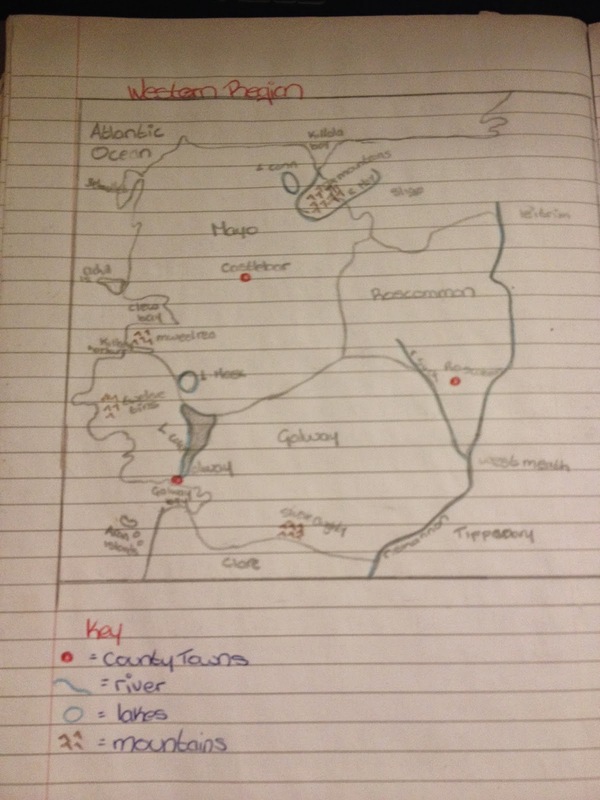 In the exam you may be asked to identify various physical features or urban centres so I have marked in the county towns of the three counties as well as rivers, lakes and mountain ranges in the region. The region is bordered by Sligo, Leitrim, West Meath, Tipperary and Clare as well as the Atlantic Ocean.